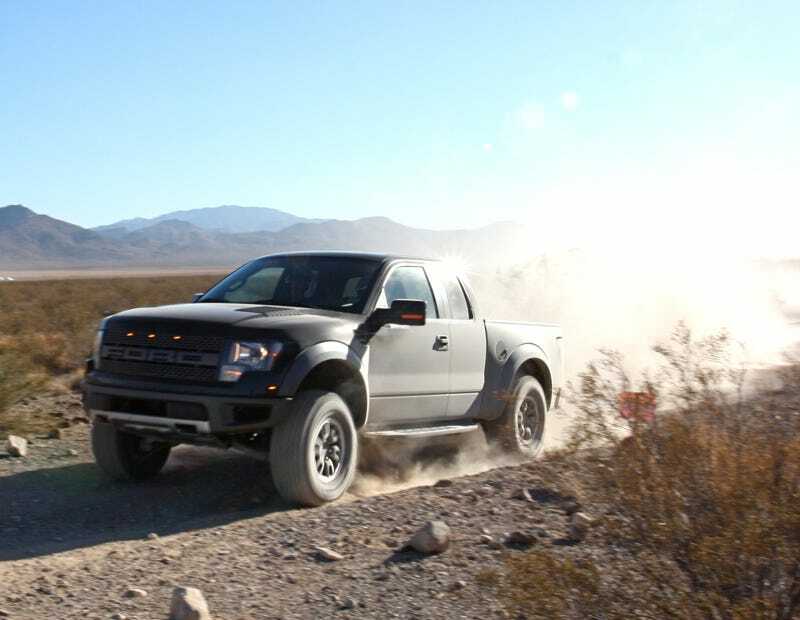 Ford took us into the desert dirt outside of Las Vegas today to show us a new stock truck package for the 2010 F-150 that looks like it may set the off-road world ablaze. It's called the F-150 SVT Raptor. Thanks to upgrades like internal bypass FOX Racing Shox, a seven-inch wider track and an upgraded front suspension, the Raptor package appears to make this the world's first stock pickup that's fully off-road capable and most importantly, built for speed. Ford Unveils the 2010 Raptor at SEMA 2008 I say appear because we only had a chance to ride in it, not drive it ourselves. However, even from the passenger seat we can tell you we've never seen a stock truck take bumps and dirt pits as well as the Raptor did today — especially while going full throttle up past 85 MPH along dirt trails we'd normally seen only well-accessorized Jeeps take at high speed. But it's not just capable, it's also hot as hell. Ford designers took advantage of the 7-inch greater width over the stock F-150, incorporating distinctive marker lamps into the tough new grille. Hidden while turned off, those lamps switch on to make the Raptor's imposing stance immediately recognizable. We look forward to spending some time behind the wheel, but for now, head below to see the full release from Ford or, for a more technical look at the new pickup package, hit up our friends at PickupTrucks.com.